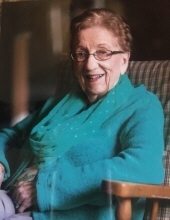 Darlene Draper Trone, 96, passed away peacefully on December 26, 2017 with family nearby. She was born March 22, 1921 in Moroni, Utah to Blaine Radie Draper and Jennie Fayora Irons Draper. She and Raymond Eugene Trone were married on August 7, 1947 in the Logan LDS Temple. They lived in Corpus Christi, Texas, Salt Lake City, Utah, and Milwaukie, Oregon. Darlene was a Portland, Oregon resident for 52 years. She was a homemaker, member of the Church of Jesus Christ of Latter-Day Saints, belonged to the Daughter of the Utah Pioneers, organist for 70 plus years, and faithfully served in the church her entire life. She is survived by her sons, Gordon (Natalie) of Portland, Paul (Katie) of Gladstone, her daughter, Colleen Stutz (Brent) of Milwaukie, and Susan Woodlief (Bruce) of Spokane, Washington, her sister Genelle Lees (Robert), 27 grandchildren, and 41 great-grandchildren. Preceded in death by her husband, Raymond Eugene Trone and her son Eugene Raymond Trone (Susan) of Oregon City. A funeral for Darlene will be held at 11:00am, Saturday, January 6, 2018 in the Oatfield LDS Chapel at 8331 Cason Road, Gladstone, Oregon 97027 with a viewing from 10:00am to 10:45am. Interment will follow at Willamette National Cemetery, January 8, 2018 at 10:30am. To send flowers or a remembrance gift to the family of Darlene Draper Trone, please visit our Tribute Store. "Email Address" would like to share the life celebration of Darlene Draper Trone. Click on the "link" to go to share a favorite memory or leave a condolence message for the family.